This little drama considers what we are really thinking when we come up against people who are different from us. For those of us who live in a multicultural, multiethnic society like London, we have the privilege of diversity. 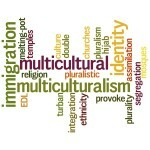 Do you live in a multi-cultural city? It’s not meant to be pointing fingers at anyone, so no disparaging remarks please. See what happens in this hilarious take of COLLIDING CULTURES when 5 very different people clash on the London underground. This little drama was written and performed by a group of friends and exhibited and performed at an arts festival called Canvas. It generated much discussion in the audience afterwards. This entry was posted in Blog and tagged Comedy, Fun, Humour, London, Multicultural, Society. Bookmark the permalink.